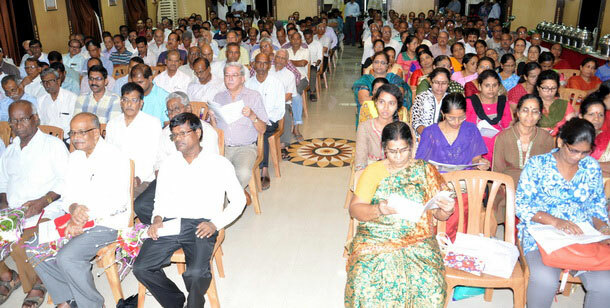 Mumbai : MOYA Co-operative Credit Society, Mumbai founded by some of the like minded people of Moya (Bovi) Community from the costal Karnataka and Kasargod district, has celebrated its 25th successful year on 3rd July, 2016 along with its AGM at Kitte Bhandari Sabhagruha, Dadar West, Mumbai under the presidentship of Satish N Uchil, Chairman of the Society. Sachidananda A. Ail, Secretary, welcomed the members and presented the annual report. Chairman Satish N Uchil, Vice Chairman Suresh A Vamanjoor, Joint Secretary Ramesh S. Kumble and other officer bearers on dais felicitated all the past Chairmen and founders members of the society who worked during the fast 25 years to strengthen this financial institution. Narayan J. Ail, who served as Chairman for a long period, explained about the formation of this credit society, and said it was during 1991 some of the community members gathered in the office premises of Industrialist K. D. Uchil and decided to form a financial institution. He also requested all the members to extend their support and co. Operation to take this co-operative society upto the leval of co-operative Bank. Other office bearers of the society Sharankumar K Ail, Vasant P. Uchil, Anant Barve, Shyamala H Udyawar, Kavita Damodaran, Arvind Mendon, Sharath Uchil, Sadashiva Moolya, Vasantkumar R Uchil, Harichandra Udyavar, Beerappa K Kumble and others were present. Sachidananda A. Ail offered vote of thanks and requested all the members to introduce more members to the society. Ivan D’souza felicitated by Bishop in Bishops house.